Back in 2013, Virginia Allain wrote, “Most of us are critical of our own looks. We easily compliment others but brush off the nice things others say about our own looks. Sometimes parents felt they had to discourage children from becoming vain and tried to instill a sense of modesty in us. Now even when we are hard on ourselves, there’s usually one feature you think is your best. Maybe it’s your eyes or your mouth or your high cheekbones. Perhaps you think your hair is what’s special about you. The eyes above are my niece’s. She has equally lovely lips, nose, teeth, and hair. Actually, she’s pretty stunning. If you asked her, she would probably start telling you all the things that are wrong with her face and figure. I think we’ve gone overboard trying to suppress vanity in young girls. As for me, I do like my big blue eyes and my blonde hair, though it used to be thicker and more reddish which I liked. I wish my nose wasn’t so stubby and that I didn’t have freckles. My eyebrows don’t contribute much to my face as they are too pale. See how easy it is to start tearing yourself down? Let’s start over and appreciate our own looks. I know my mother, Gail Lee Martin, avoided the camera later in life if she hadn’t had her hair styled recently or if she was just wearing her comfy around-the-house clothes. I wrote about how pretty she was in her eighties. She was uncomfortable with my doing that. 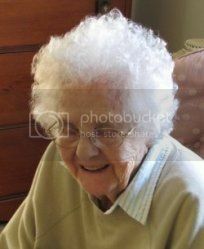 Here is that post: Beautiful Octogenarian. What do you consider as your best feature? Eyes, smile, cheeks, hair, ??? In sorting old photos for my mother’s book about her childhood in the 1930s, I was intrigued by the pictures of family cars through the decades. I’ll share some of these vintage car pictures here with you. This photo shows my mom, Gail Lee Martin, between two of her school days friends. 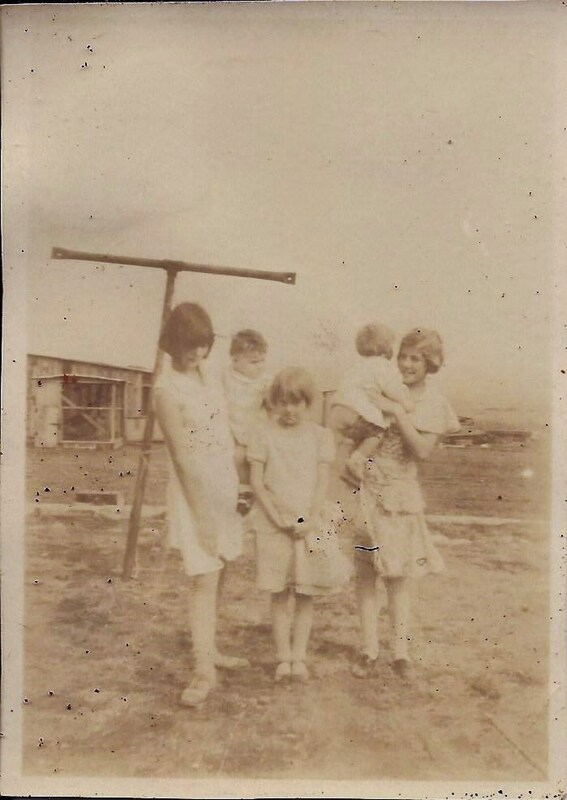 They are posing with her dad’s new car in the 1930s. She was fortunate during the Great Depression of the 1930s, her dad had a job when so many could not find work. Mom had sorted the family photos into cigar boxes. There was one box labeled “CARS” so here are those great old automobile photos from the 1920s and 1930s. This photo was labeled “Albert Vining – new car.” Albert was Gail Martin’s uncle. This one labeled “Pearl Tower” looks like the same model of car, though a bit worse for wear. I’m not sure what the purpose of the addition on the running board is for. Pearl Tower and Albert Vining both lived in Tyro, Kansas, and she was his sister-in-law so it is quite likely that this is Albert’s car. The photo above was labeled “Roy, Sam and Clarence McGhee with Car on the Phillips Petroleum Lease.” Clarence was Gail’s father, Sam was her grandfather, and Roy was her uncle. This also looks like the same model of car. My sister, Karen Kolavalli, is our guest blogger for today: “A snow storm like this meant our country school would be closed when I was a kid. All six of the Martin kids would have been out playing in the snow until we were sodden and frozen. We’d come in and huddle around the wood stove to thaw out. Mom would already have hot homemade cocoa ready for us and we could look forward to potato soup with bread and homemade butter or pancakes and eggs for supper. 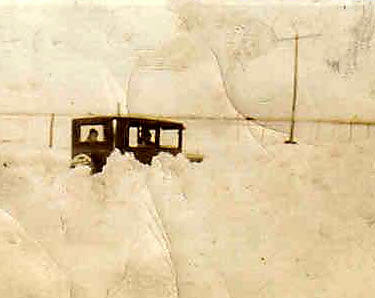 Snow in the Flint Hills of Kansas back in the 1920s. I don’t know if that is little Gail McGhee in the back seat or not. If Mom were still here, we could ask her if she remembers the Armistice Day Blizzard of 1940 that raged from Kansas to Michigan. I did find a poem she wrote in 2006 inspired by the snow and ice that Kansas was having then. In 2007, icy day motivated her to revise Ice Storm and feature it with her granddaughter’s photos on the Our Echo website. Here’s another snowy photo from the McGhee family album. Clarence McGhee pulling daughters, Melba and Gail, on a sled. In the background is the lease house. Maybe 1926 or so. I had the idea of getting a sketch made of Mom. My thought was to use it when reissuing some of her family stories in individual editions. Now with CreateSpace and Kindle Direct, it’s possible to reach a wider audience than ever before with self-published books. There’s a site called Fiverr with freelance artists and writers willing to work for $5 or $10. Many are in places like Asia or South America where $5 goes further and they appreciate the chance to reach an international market for their talent. You can view examples of their work and commission one to draw a portrait. I opted for the $10 version and supplied a photo. This was the resulting graphic. For those reading this who actually knew Gail Lee Martin, what do you think of the likeness? I thought the hair was a little stiff looking and maybe too high in the center. Then I looked at the photo that I supplied and decided the artist did quite a reasonable job capturing Mom. Share your reaction in the comment section below. The artist who created this was Polillavw of Argentina. 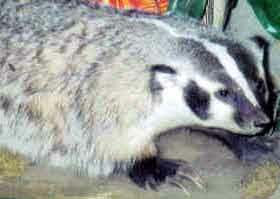 I’d never think to have a pet as ferocious looking as a badger. They have fearsome claws and are noted for their digging. My mom was given a baby badger back in the 1930s and she raised it and kept it as a pet. She tells some remarkable stories about what it was like to have a pet badger. Here’s more information about the American badger and more about her pet badger. Mom took this photo at a museum. She said it reminded her of her pet badger, Jolly. on the Blurb.com website (or click on the preview above). The book won the 2010 Ferguson Kansas History Book Award. Young Gail McGhee in front, center. The shed in the background might be the wash house that the badger lived in, where he dug tunnels in the dirt floor. Gail Martin describes in her book how they raised the badger as a baby. This video shows a European baby badger, but it would have looked pretty similar to this. Note that it has a harness. It also digs just like my mother described her pet badger digging in their potato patch. A collar didn’t work for the badger as it would just slip off over its head. 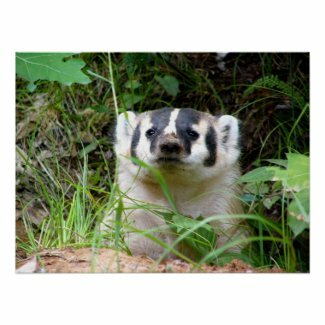 American badgers are found from southern Mexico through the western two-thirds of the United States into southwest Canada. 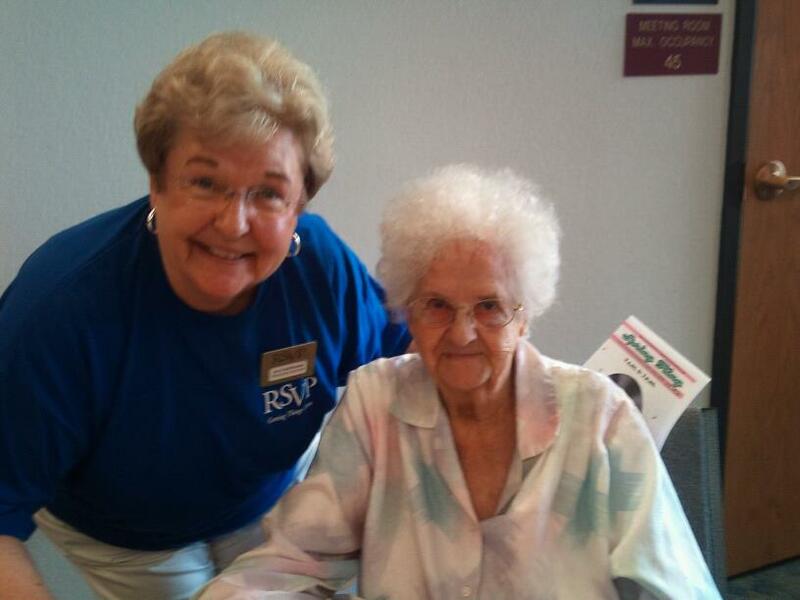 “I was talking with Carol about when she was in second grade at Seeley, a country school. She had Mrs. Neumayer as teacher and that teacher’s daughters, Peggy and Ann, attended the school too. 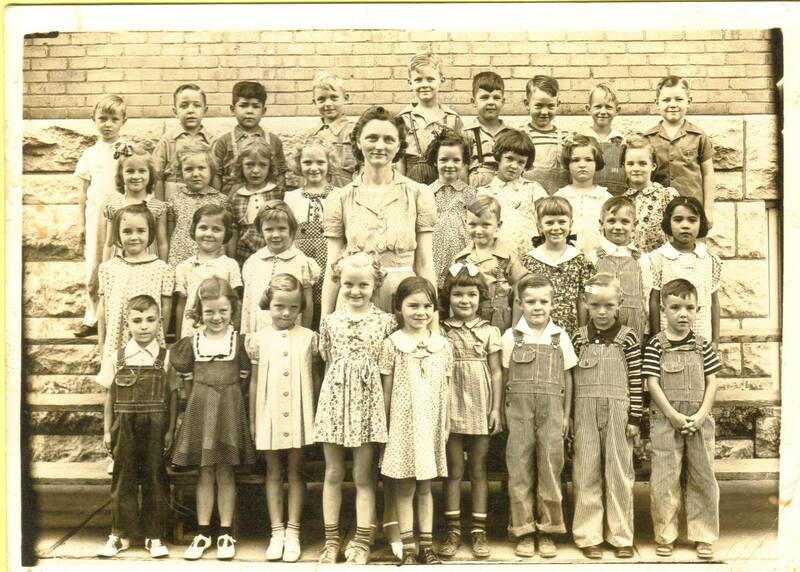 Seeley School, 2nd grade class with Carol Jean McGhee in it. I think Carol is 3rd from the left in the front row. 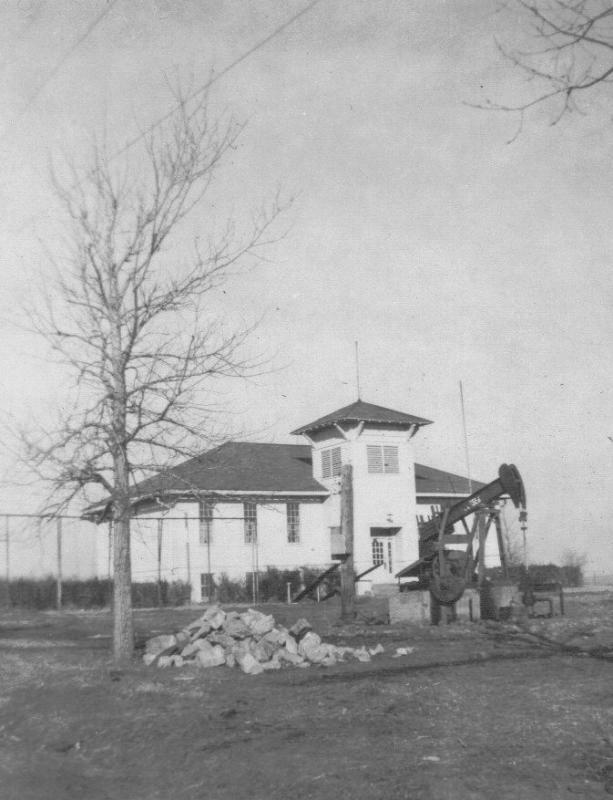 View of the Seeley School with an oil pump jack in front.